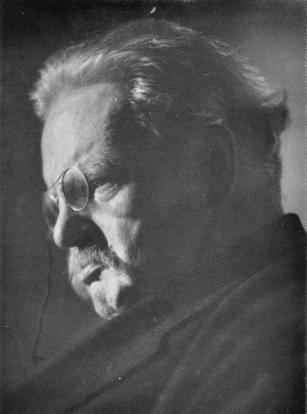 Thus far into G.K. Chesterton’s Orthodoxy, I can only describe it by comparing it to C.S. Lewis’ writings. It has the same winsome persuasion of argument, the same spiritual insight, the same economy of words and lucid prose. Orthodoxy is marked by ironic turn after ironic turn, an extraordinary juxtaposition of high philosophy with mundane metaphor, an almost perfect clarity and succinctness. Its one of those books where almost every sentence is quotable. A man cannot think himself out of mental evil; for it is actually the organ of thought that has become diseased, ungovernable, and, as it were, independent. He can only be saved by will or faith. The moment his mere reason moves, it moves in the old circular rut; he will go round and round his logical circle, just as a man in a third-class carriage on the Inner Circle will go round and round the Inner Circle unless he performs the voluntary, vigorous, and mystical act of getting out at Gower Street. Decision is the whole business here; a door must be shut for ever. Every remedy is a desperate remedy. Every cure is a miraculous cure. Curing a madman is not arguing with a philosopher; it is casting out a devil. Nietzsche had some natural talent for sarcasm: he could sneer, though he could not laugh; but there is always something bodiless and without weight in his satire, simply because it has not any mass of common morality behind it. He is himself more preposterous than anything he denounces. But, indeed, Nietzsche will stand very well as the type of the whole of this failure of abstract violence. The softening of the brain which ultimately overtook him was not a physical accident. If Nietzsche had not ended in imbecility, Nietzscheism would end in imbecility. Thinking in isolation and with pride ends in being an idiot. Every man who will not have softening of the heart must at last have softening of the brain. I love Chesterton. Orthodoxy is one of my favorite books. In fact, maybe my favorite passage from any book ever is in it. The part about God being younger than we are and never getting sick of making daisies. Awesome stuff. G.K., I love the way you thought. Matt! Its good to hear from you man. Say hi to Josh for me. If I am ever in the area we need to reenact one of our classic nerf wars.